Rooibos is a naturally caffeine free herb with a sweet, fruity flavor. It pairs well with cinnamon, cloves, nutmeg, cardamom and vanilla. 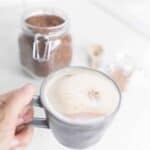 Although it’s not made like a traditional latte, this frothy drink is the perfect sweet treat when you just need a little something to warm you up. Pour water into teakettle or pot to bring the water to a boil. Add loose leaf rooibos tea to a French press or glass jar. Allow it to steep for 10 minutes. Strain the leaves from the water, by either using a French press, or through a thin tea towel over a glass bowl. Combine the brewed tea, butter, coconut oil, honey, vanilla, cinnamon and nutmeg in a blender. If you would like to make it with pumpkin, you can add that in now too. Blend on high speed for at least 30 seconds. This helps to create all that beautiful froth. Pour Pumpkin Spice Rooibos Latte into your favorite mug and enjoy.